Technology is always moving forward. Computers got faster and smaller throughout the decades to the point where they are now physically impossible to make any faster or smaller due to physics. We have the manufacturing knowledge to do it, but the physical size of an electron is now limiting us from designing smaller or faster CPUs. So in order to continue to improve, we have to change the direction of technology, and that’s fine because we know exactly how to do it – by using the CLOUD. The next generation of Centennials (Generation Z) has never lived life without the internet. They expect to simply download an app or browse to a webpage to get the information that they need, instantly. Complex software installations, managing a server, and lengthy training sessions are the past. The future is collaborating on the cloud, with everyone focused on the design itself, rather than the hardware and software to get there. When I was a kid, if I wanted to buy music, I took the bus to a mall and walked into a store selling albums or CDs, and bought the entire album/CD for the one song that I actually wanted. Today, with apps like Spotify, iTunes, Google Play, and others, you can pick the song you want or even subscribe and get ongoing new music based on your preferences. I have to say, this instant gratification thing is pretty cool. I like it too. Remember Blockbuster? Every weekend, I’d go to Blockbuster and pick out one or two movies, and they’d have to be returned the next day (and I couldn’t forget to rewind the VHS tape!) Today, we login to Netflix or Hulu, or order movies on demand. No need to return or rewind them. Music, movies, and other entertainment has been moving us in this direction for a while. xDesign uses the cloud for sharing files, and best of all, it requires no installation as it is accessed online using a browser. Yes, that means any browser – from Edge to Firefox to Safari, and more. You can use a PC, MacBook, tablet, or any other means to get to a browser and start using xDesign with your log-in credentials. Traditionally, engineers design a model, then simulate the environment around that model to see how it reacts, and whether it will withstand the forces upon it. If the result shows that the model will fail, the engineer will tweak a dimension or change the material and try again. With xDesign, rather than making an educated guess at the design, and then testing it, they simply put the desired parameters into the software, and let xDesign do the work for them! It’s like design optimization on steroids! A design emerges that meets the parameters they asked for. No one enjoys managing data; it’s a high-burden, low-appreciative job. That’s another reason why xDesign is so attractive. Data management is built in. You can save, version, and share your designs as you see fit. There is also a “branch and merge” feature that enables you to merge your design with someone else’s design and keep both of your edits. No more “last to save wins” – you can both win! You can also link to Dropbox and Google Drive. What would happen if you could effectively team up with others to brainstorm and create an EVEN BETTER product? No I’m not talking about lengthy weekly meetings in a bored-room, err, I mean boardroom. I’m talking about really and truly working together. You can work with internal team members, or external contributors, through secure and safe communities, have complete control over file access and sharing, lightweight visualization, and product review. Mass reduction is an automated way to make your model lighter, and hence, less expensive. As with Design Guidance, you set the parameters, and xDesign will automatically analyze your model and look for places that can be reduced without affecting the integrity of your design. It will still have the required strength for the job it’s designed for, but will be lighter. We all need to manage our time. What if we had a tool that could help us plan our time better? Say no more. xDesign gives you the flexibility to create collaborative tasks, and assign and link those tasks to the models you’re working on. You can manage the tasks and monitor the progress with a handy dashboard to see where your project stands. 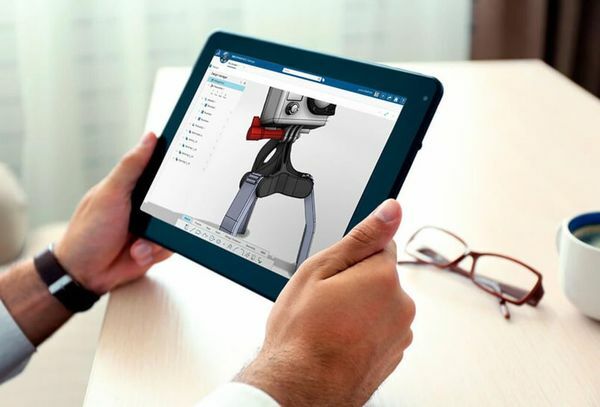 Check out xDesign HERE to see how you can improve your engineering and design experience, and move forward to the future. For more information about xDesign and how it can help you and your team, please contact your Value-Added Reseller. Jenn Doerksen works for Dassault Systemes SOLIDWORKS, as a Territory Technical Manager. She has been part of the SOLIDWORKS community since early 1997, when she bought her first license of SOLIDWORKS while working at the BCIT Technology Center. Since then, she has worked for a local Value-Added Reseller, presenting, teaching and supporting SOLIDWORKS for several years, and has worked for SOLIDWORKS directly since early 2005. She has a Bachelor’s of Engineering from the University of Victoria and lives with her husband and three dogs in Vancouver BC, Canada.